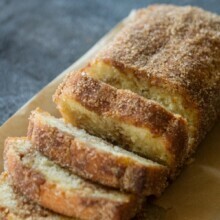 This Swirly Cinnamon Bread recipe is a cakey bread, baked until perfection and then dipped into butter and coated with cinnamon sugar! Preheat oven to 350 degrees. Grease light colored loaf pan with non-stick cooking spray and set aside. In large bowl, mix oil, butter and sugar until well combined. Stir in eggs and vanilla until smooth. Gently stir in dry ingredients and buttermilk until uniform batter has formed. Scrape sides to ensure no lumps are present. Remove 1/2 cup prepared batter from bowl and place into a separate smaller bowl. To that small amount of batter, stir in cinnamon and molasses. Pour half of the prepared batter into the bottom of the loaf pan. Spoon half of the cinnamon batter in small dollops overtop the batter. Pour remaining plain batter over the top. Dot the top with remaining cinnamon batter. Using a butter knife, swirl two batters together. Bake 45-50 minutes or until toothpick comes out with a few moist crumbs. While loaf is baking, get coating ready. Pour melted butter into a large shallow dish. Stir sugar, brown sugar and cinnamon together in a separate large shallow dish. Cool 10 minutes before loosening edges and removing loaf from pan. The loaf should be very warm, but cool enough to handle with your hands. Dip each side of loaf into melted butter until fully coated. Spoon remaining melted butter over the edges that tend to be more crispy. Transfer buttery loaf to the cinnamon-sugar mixture and press into the sides and top until fully coated.